High performance waterproofing liquid asphaltic compound used as damp proof membrane, radon barrier and as a water-repellent weathering coat. A high performance waterproofing liquid used as damp proof membrane, radon barrier and as a water-repellent weathering coat, used prior to the erection of masonry. 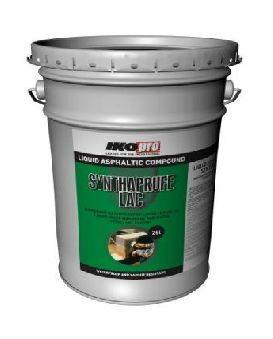 May be used to protect foundations, retaining walls (in conjunction with Hyload tanking membranes), abutments, steel columns, beams and lintels. Highly effective as a background weathering for structures behind rain screens and terracotta cladding. Water vapour permeability: 0.14 g/m² per 24 hours. Curing time: 24 hours (touch dry).